This page will show you how to configure your Datapath’s Vision software to get near-perfect captures, directly from your console’s output with no scaler. 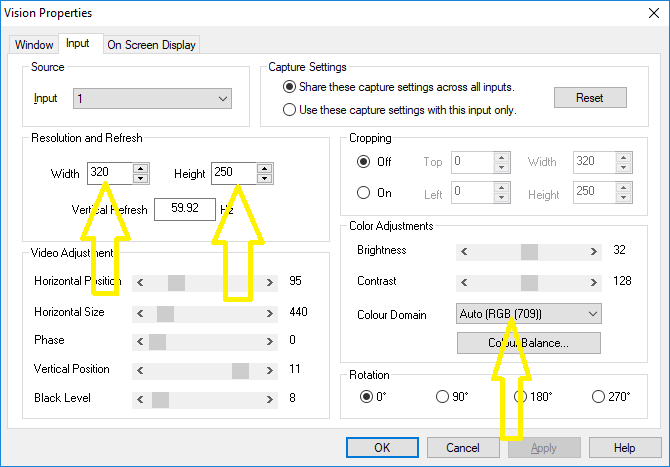 Before even opening the capture software, you’ll need to start by determining the exact resolution of the game you’re trying to capture. Some consoles like the Genesis will be easy, as all games output at 320×256, except the ones on this list FirebrandX created. Other console resolutions might be harder to find, so sometimes I end up loading an emulator, setting the video to 1:1 and taking a screenshot. Then I just reference that resolution. In this example, I’ll use a Genesis game that always runs at 320×256, just to keep it easier. You’ll sometimes run into games that switch between 240p and 480i, as well as games with multiple modes! I’ll try and do an advanced version of this guide for those scenarios, but for now, let’s stick to the basics. Now that you know the resolution, load up the Vision software and get ready for one of the weirdest bugs I’ve ever seen in software (I’ll get to that in a bit). – Power on your console and load the game you’re looking to capture. – Hit the “reset” button and note the resolution. Make SURE you’ve loaded the game and are in a main gameplay section before doing this, as many games use different resolutions for title screens or menu’s! Note the width and height listed – They will be different from the game resolution, but are important. 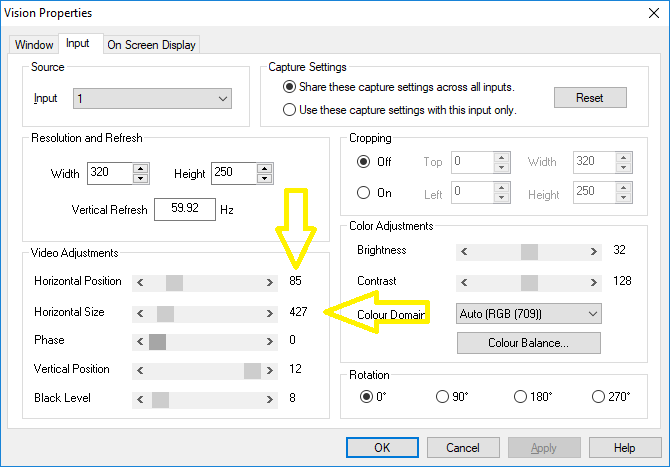 – The color adjustments need to be set to YUV for component and I normally leave it on Auto for RGB. – Switch to the “Window” tab. – Set the resolution to match exactly what was listed in the Input tab. – I leave scaling at “fast”. I don’t think it matters for what we’re doing (1:1 configuration). Now we need to determine the Horizontal Size. The easiest way to do this is by checking the R3 wiki to see if someone has already calculated this: http://r3.fyi/ For Sega Genesis 320, it’s already been determined that the exact hsize required is 427.50. Unfortunately, the Vision software has to round up to single numbers, sometimes making perfect configuration impossible. For Genesis, I usually use 427, but you can try 428 if you have issues. If there isn’t already a determined hsize, you can try to find another game with the same horizontal resolution (samples). For example a SNES game running at 256×240 will have an hsize of 341. That means (in the context of this guide) any other 256 game should have an hsize of 341. If all else fails, you can try eyeballing it. 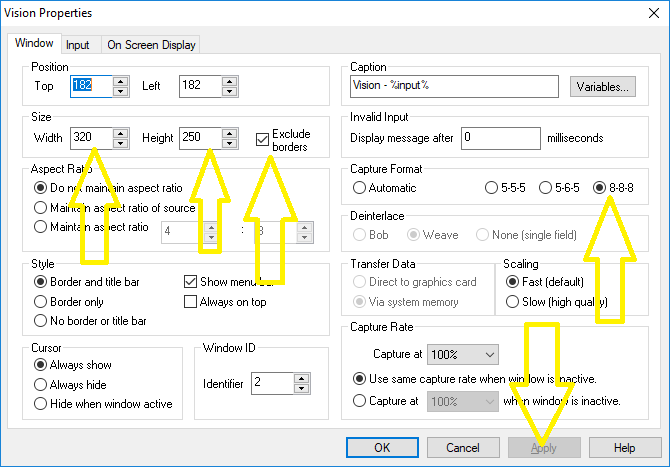 As long as you’ve followed the steps above (reset and set the window size properly), you can attempt to change the hsize and Horizontal Position until the game just fits the window. I’ve tried this a few times and it was hit-or-miss. Once, I guessed the exact size and it was perfect, but most of the time it’s slightly off. 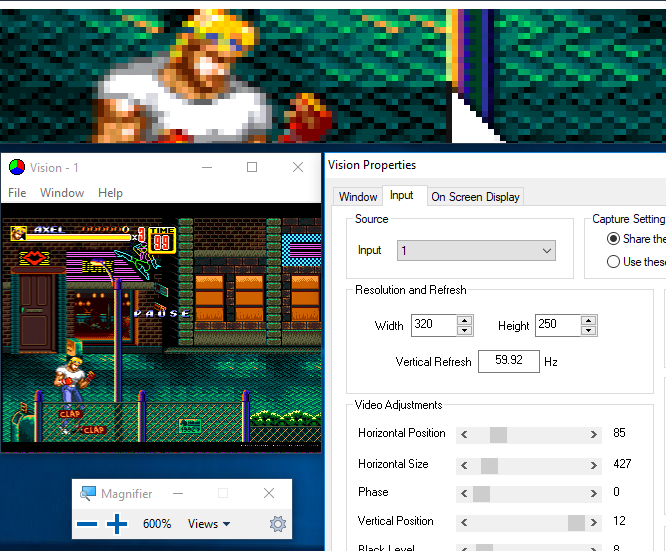 – Move the Horizontal Position slider until the game perfectly fills the window. 85 was right for me, but it might be slightly different. – You can crop if you’d like, but I do all of that in other software. – I don’t touch any of the other settings. Now we have to determine phase. This will be different pretty much every time. Different consoles, different filter settings, toggling the sync stripper…pretty much everything effects phase and you should count on tweaking it each time you’re ready to capture. By far the easiest way to dial in phase is by loading up a checkerboard pattern. You can then just move the phase slider until there’s no noise on the screen. Sometimes there’s no perfect position though and I assume that has to do with the Datapath card only adjusting one number at a time. In those cases, just try to get it as good as possible. If you don’t have the ability to load a checkerboard pattern, try to find a screen with lines on it and see if you can dial it in that way. One trick I use is the Windows magnifier. Load it up, but make sure you uncheck “smooth edges”, or the image won’t look right! Also, I suggest the “docked” view, to make things easier to manage. Now hover your mouse over the Vision window with the magnifier loaded and dial in the phase until there’s no noise on the screen. Everything else is easy compared to phase. I know this seems like a lot so far, but once you’ve gotten used to it, dialing in the settings takes seconds. Phase is always a pain. Now, hit “no”, you don’t want to “undo” the changes. Messed up right? If you had hit “apply” or “cancel” instead, all of your settings would have changed and you’d have to re-set everything. To make matters worse, I’ve saved these settings to a file through the Vision window, just to have that file save on it’s own with different settings at some point. It’s my strong suggestion that you just reference the R3 wiki for hsize and hposition, tweak hposition as needed and dial in phase. Now, make sure to leave this window open!!! Even when you open other software to access it, the configured window must stay open!!! I promise after doing this a few times, it’ll seem much easier!!! Honestly, once you’ve determined the settings, it’s just a matter of tweaking phase each time. Click here to go to the next section: Video capture software. Click here to go to the main capture page.